The latest format! CMS-1500 insurance claim form with peel and stick mailing label. New revised (02/12) format with NO bar code and split provider identifier fields. Revised CMS-1500 form (version 02/12). No bar code, mandatory April 1, 2014. 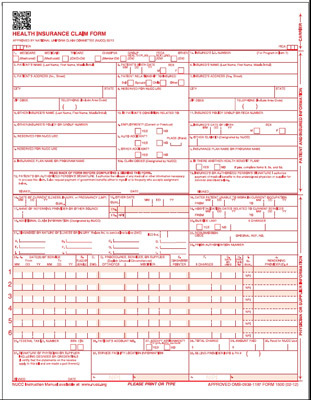 These are revised CMS-1500 (02/12) forms, and are mandatory for all claims filed on or after April 1, 2014. The bar code has been dropped from all versions of the form. January 6, 2014 — Medicare begins receiving and processing paper claims submitted on the revised CMS-1500 claim form (version 02/12). January 6, 2014 through March 31, 2014 — Dual-use period during which Medicare continues to receive and process paper claims submitted on the old CMS-1500 claim form (version 08/05), as well as on the new revised CMS-1500 claim form (version 02/12). April 1, 2014 — Medicare receives and processes paper claims submitted only on the revised CMS-1500 claim form (version 02/12). The above timeline is pending finalization and is subject to change.